Captain makes a guest appearance with the Chanukah crew. 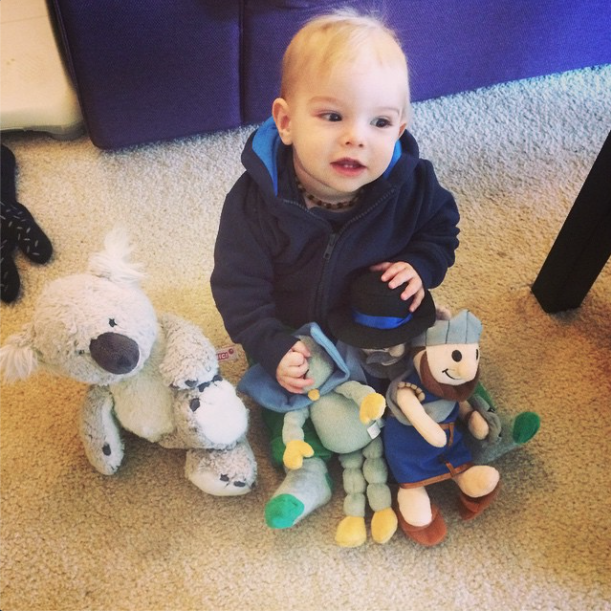 My house is full of cute plush creatures and their tales of Chanukah miracles and Asher couldn't be happier! Yes, we're the proud owners (thanks to receiving these for review) of the Gelt-Giving Golem, Mensch on a Bench, and Maccabee on the Mantel. Each of these plush cuties comes with a box and a book that tells a bit about the Chanukah story, a bit about the character, and a bit about the celebration, the brochot (blessings), and how-tos when it comes to the eight day festival. Likewise, all three encourage the new owner to give a unique and special name to the Golem, Mensch, or Maccabee. The three are very different in terms of what they bring to the table for the discerning, gift-giver. I always say that I'm boldly honest when it comes to my reviews, and I won't hesitate with that promise here. You've probably seen the Mensch on a Bench in your local Target or Bed, Bath, and Beyond, as it's the most well-advertised in the mainstream. It's also probably the most substantial "kit" out of the three, as it comes with a mensch decked out in a black hat, tallit, and beard; a book about how to be a mensch (a generally good person); and a removable bench for his lounging pleasure. The mensch holds the shamash (that's the candle that you use to light the other candles on the Chanukah menorah) at the ready for each night of Chanukah, and I love that you're urged not to actually let the mensch light your menorah. I really like the idea behind this kit, and the plush mensch has a super expressive face (we named him Mordechai) and a well-thought-out outfit and brand. Of the three, however, it isn't Asher's favorite. "tells the tale of the Hanukkah Golem, a friendly character who was formed from clay by Rabbi Ben Bezalel on the 25th of Kislev, the first night of Hanukkah. The Hanukkah Golem teaches children to practice Tikun O'lam (repair of the world) and shares chocolate gelt with children who are well-behaved during the holiday." In this sense, its theme is the closest to the popular Elf on the Shelf, what with the Golem geared toward overnight antics and the promise of treats. I will say that the plush is not very impressive (especially compared to the other two), although he does have velcro on his hands and feet so you can easily attach him to things in your home. If anything, Asher really loves that the Golem has a cape, because we can make him fly. Even still, he's not Ash's favorite! Of all three of these Chanukah-themed boxes of meaning, inspiration, and fun, this is Asher's favorite by far. It is the most substantial and high-quality of the three when it comes to the packaging and presentation, with its almost anime-style illustrations in its book, and the plush itself is very light and soft in its features, which seem to really appeal to my little one. I also think The Maccabee on the Mantel provides the nicest tie-in to Chanukah overall, what with the plush and almost squishy-soft/hard-cover book highlighting the miracle of Chanukah and the role of the Maccabees. Of the three, it seems like it's the most true to the message of Chanukah. Note: I have a bunch of pictures of Asher + the Chanukah crew and how he reacted when we received them and opened each of them, but I have to find them to post. When we opened Maccabee on the Mantel it was almost like the Maccabee walked out of the box! His jaw dropped and he did this sort of "air release" sound. It was freakin' adorable.